India is pushing hard to electrify its automobile market, aiming to sell only electric vehicles (EVs) by 2030. But what impact will that shift have on the country’s utilities and the grid? A new report by scientists at Lawrence Berkeley National Laboratory (Berkeley Lab) has found that the prospective EV expansion will deliver economic benefits, help integrate renewable energy, and significantly reduce imports of foreign oil. Using detailed transportation and electricity sector models, researchers projected the impacts of an EV ramp-up on India’s grid, economy, and emissions. They found that added electric demand from EVs could bring India’s financially strapped power utilities $11 billion a year (700 billion rupees) in revenue, enough to cut the sector’s financial deficit by at least half. Meanwhile, the added power demand could also help smooth the transition toward renewable energy as the country strives to add 100 gigawatts of solar and 60 gigawatts of wind by 2022. “Renewable energy and electric vehicles are quite complementary to each other in India,” said lead author Nikit Abhyankar of Berkeley Lab’s International Energy Studies Group. “A renewable energy-powered grid will reduce electric vehicle emissions, and electric vehicles, in return, can help the grid absorb all that renewable energy.” The team found that an EV scale-up would reduce per-mile carbon dioxide emissions by a fifth or more, even on a coal-heavy grid. The paper is the first to assess the impact of India’s electric car goals using a rich behavioral model of how people charge their vehicles combined with a detailed model of the grid, Abhyankar said. The grid impact of scaling up electric cars to such a degree— orders of magnitude more than the few hundred thousand on India’s roads today—was surprisingly low, the researchers found. A few factors explain EVs’ 6 percent share of peak load in 2030. First, other sources of electricity demand—particularly air conditioners—will be dominant over the next 15 to 20 years. Second, two-wheelers that require less energy than cars will account for a majority (32 million a year versus 10 million for cars) of the EV penetration. Finally, overall vehicle ownership will be lower in India than in other industrialized economies. “Despite that being a small load,” said Abhyankar of EVs’ share, “it’s also a well-paying load.” He noted that because EVs will be adopted initially in urban areas with higher electricity rates and by middle- to upper- middle class drivers, they will provide an attractive customer base and source of revenue to utilities. India currently depends on foreign imports for more than 80 percent of its crude oil supply. Switching to electric cars would substantially lessen that dependence, reducing consumption by 360 million barrels annually, or 15 percent of the total, by 2030. That translates to an annual savings of $7 billion (450 billion rupees) a year, assuming a conservative crude oil price of $40 per barrel. 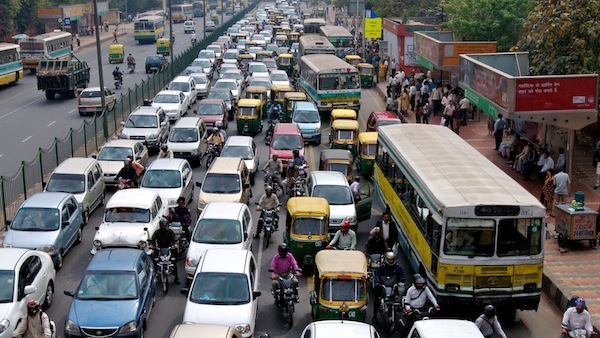 If India converts to 100 percent electric vehicles and retires older gasoline and diesel-powered vehicles by the mid-2040s, the paper says, the avoided oil consumption grows to 60 percent of the total at an annual savings of $100 billion (6.5 trillion rupees). The authors caution that India will need to build out its charging infrastructure in order to realize these benefits. That would be capital intensive, but could be financed using the additional revenue from charging. They also note that the charging load could affect local distribution networks, a problem that could require significant upgrades. Smart charging, or shifting the charging load to different times of day depending on overall demand, will be key if EVs are to be a truly useful accessory to renewables. If charging can take place mostly during the day, or is adjusted to tackle the intermittency in generation, drivers can take advantage of solar generation when it’s strongest, preventing curtailments or inefficient operation of thermal power plants. Future research will focus on the opportunities to electrify vehicles used by India’s booming ridesharing market and on the deployment of charging infrastructure needed to support large volumes of EVs, Abhyankar said. India’s ambitious electrification plan is attainable, particularly given dropping costs for lithium ion batteries, the report concludes, but further analysis can help determine the best path forward. Abhyankar authored the paper with Berkeley Lab’s Anand Gopal, Colin Sheppard, Won Young Park, and Amol Phadke.